Need to get rid of unwanted paint? This Guide will help you navigate the different ways to handle various types of leftover paints, allowing you to better protect human health and the environment. 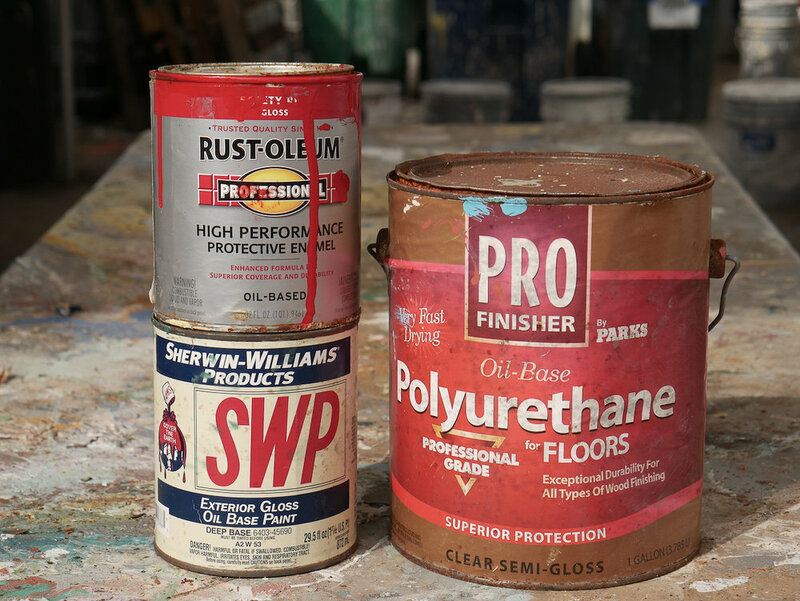 Latex or water-based paint is not considered a hazardous waste when in solid-from. It can be cleaned with soap and water. Latex paint may be put in the trash if dried properly. Can this be donated to the Green Project? Latex paint may be donated to the Green Project if it is usable and in its original container. See our Donation Guidelines for more info. Oil-based paints and stains are considered hazardous materials in any form (vapor, solid, liquid) due to their flammability. They must be cleaned with turpentine or paint thinner. Oil-based paint cannot be put in the trash. Oil-based paints or stains may not be donated to the Green Project. Aerosol paints are contained in pressurized cans which may explode if disposed of improperly. This paint is not recyclable and should be emptied before discarding. Spray paint may not be donated to the Green Project. What if I can’t donate to the Green Project? If you have a small amount of paint left (just one or two inches), you can remove the lid and leave your paint out to dry. Remember to keep it out of reach from any kids or animals. Once hardened, toss it in the garbage, leaving the lid off so waste collectors can verify it has been solidified. If you have too much paint to dry out in the can, you can line a cardboard box with plastic and pour about an inch of paint in the bottom. Once that layer has solidified, pour another on top, and wait for it to dry. Repeat this process until the can is empty, and then dispose of the box. Combine equal parts cat litter and paint (if you have over half of a can left, you may need to pour paint into a larger plastic or cardboard container). Stir completely. The mixture should harden in about 10 minutes, but if it is still runny or soft afterwards, add more litter until it is thick. Allow the mixture to sit for one hour, then dispose of it (without a lid) in the garbage. Sawdust, dirt, or shredded paper may be substituted for cat litter. Adjust proportions as necessary. Commercial paint hardener can be purchased to turn liquid paint into a solid for curbside disposal. Follow directions as listed on the product. The results should be a tacky, oatmeal-like consistency that will not spill out of the can. Oil-based paints are hazardous materials which must be disposed at a specific hazardous waste collection site. Most municipalities host Household Hazardous Waste (HHW) drop-off events at least once a year. Click here to learn more about Household Hazardous Waste and New Orleans-area collection events. Place newspapers or cardboard on the ground and spray the remaining paint onto them. You can be sure the can is empty and disposable once the hissing noise stops. The metal can may be recycled curbside. Do not dump paint down storm drains or onto the ground where it can travel directly into local waterways. Do not pour paint down your household drains. Wipe excess paint off tools before washing to avoid unnecessary paint contamination. Do not put liquid paint in the household trash. This is illegal due to its messy and harmful consequences. Do not overbuy paint. By using online calculators you can avoid having leftover paint altogether. Do not buy oil-based paint when possible. Latex/water based paint with low concentrations of volatile organic compounds is better for the environment. It is really important to make sure paint is disposed of in the right way. Otherwise, it can end up damaging landfills, destroying sewage systems, and even contaminating the water that we depend on for drinking and recreation.